1. Cut a piece of 6 x 12” patterned paper or cardstock. 2. Take all the little bits of ticket stubs, small pieces of paper and scraps and collage on the base paper. 3. Add some journaling in spots, stamp and decorate. 4. Add some ribbon and attach with a brad on one end. 5. Fold over and glue a 1 1/2” strip of paper, folded at 1/2”, on the edge to cover the brad ends. 6. Roll the paper up so that the brad is on the outside of the roll and tie with the ribbon. This is the end of our trip, and we have a beautiful handcrafted item to store our memories in from our wonderful adventure. We hope you have enjoyed traveling with us and we will see you soon in all the usual places! Arriverderci! 1. Take 2 8 ½” x 11” pieces of paper and fold in quarters. 2. Glue the bottom right quadrant of one piece behind the top left quadrant of the other; glue on three sides only to make a pocket. Punch a half-circle in the top of the pocket. 3. On the flap to the right of your new pocket, cut up two inches from the bottom and cut across. Bend to the back of the square above it to make a pocket. 4. Turn paper over and fold flap down – glue into a pocket. Cut a half-circle. 5. On the top left quadrant of the top piece of paper, cut across on the horizontal score line to the first vertical fold. Bend back and glue top and bottom to form a side pocket. Cut a half-circle. 6. Cut two inches off of the bottom center piece of paper, fold up and make a pocket, so that you have two pockets on that page. 7. Fold as follows: fold the far-right piece into the center, fold the top-most piece behind in back, fold the left-center piece in front to make the cover. 8. Tie with a piece of lace and a small flower. 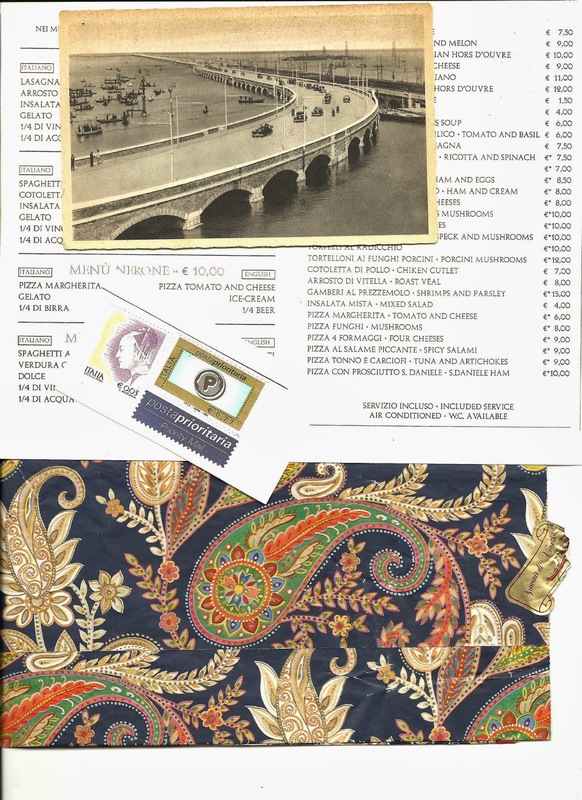 This is a download of things I had from my last trip to Italy. 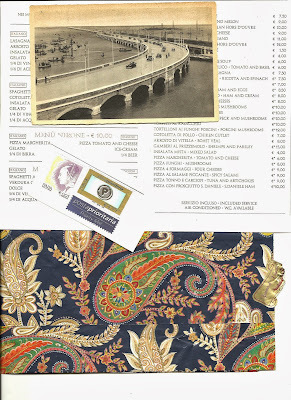 Some Italian postage stamps, a gift bag from Venice and a menu from a ristorante in Florence. I hope you enjoying this Tales from Tuscany series, we can not wait to share more! Just RIGHT click on the photo and save to use in your project. 1. Take 5 postcards or postcard-size papers. I used two pieces of paper to form the front and back of the postcards. 2. Cut a 2” x 4” piece of cardstock for an optional pocket. 3. Line up as pictured, leaving 1/8” in between the cards. 4. Attach with washi tape on the front and back. 5. Fold in the way that each piece folds flat. 6. Attach a charm to a paper clip and use to hold postcards together. 1. Take one piece of 8 ½ x 11” cardstock. 2. Score on long sides at 2” and 6 ½”. 4. Cut out squares on the end formed by the intersecting score lines, fold triangles into center to form a flap. 5. Fold on other score lines. 6. Take two pieces of 4 x 12 patterned paper or cardstock, fold in thirds. 7. Overlap the pages so that you have one page and one foldout on each side. 8. Punch small holes in the folded sections of the cover and in the pages and tie with twine so the knot is on the inside of the journal, trim the ends. 9. Make two photo mats and place in the pockets formed by the two folded pieces inside the cover. 10. Fold up and decorate. 1. Cut a piece of 8 ½ x 11 cardstock or patterned paper to 6 x 11. 2. Score at 1” on the left short side, 2” from the end on the right side. Fold in. 3. Fold folded paper in half. 4. Add a piece of paper to make a pocket to the right side. 5. 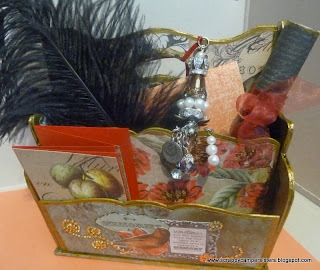 Cut up some book paper and make a “junk journal” on the left side. 6. Attach book papers to the inside of the 1” flap. Staple or attach with twine. 7. Make a cardstock circle and attach on the flap with an eyelet. 8. Wrap with twine and place a bead on the end. Hey everyone! If you are following Darcie and my Tales from Tuscany you might be interested in a few photo downloads for your projects. Turn them into postcards or tear and collage. 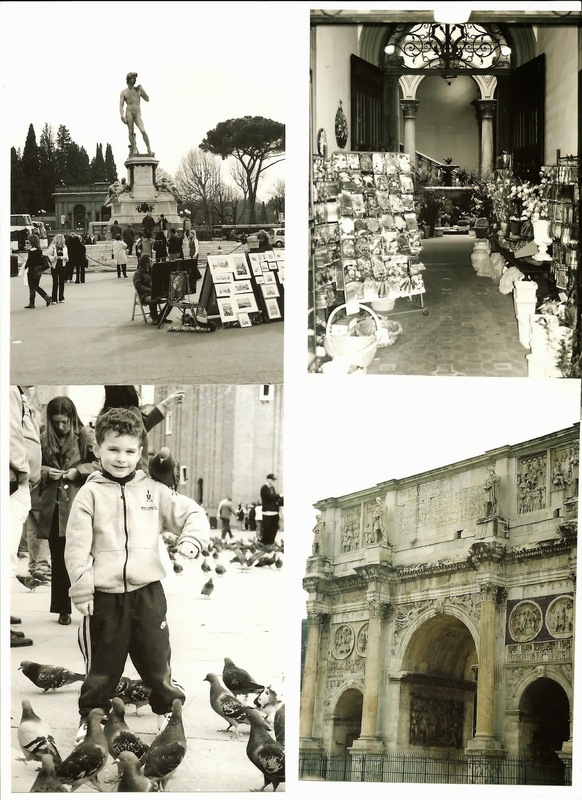 The picture of the little boy I took in St Mark's Square in Venice, Italy in 2004. Isn't he cute with the little pigeon on his shoulder. He would look cute photo tinted. Well stay tuned for 3 more downloads. Just right click on the photo to save and print for yourself. 1. Take two cards and two envelopes. Ours are approx. 4 1/4" x 5 3/4"
2. Glue one envelope flap inside the other envelope. 3. Mat the two cards with patterned paper. 4. 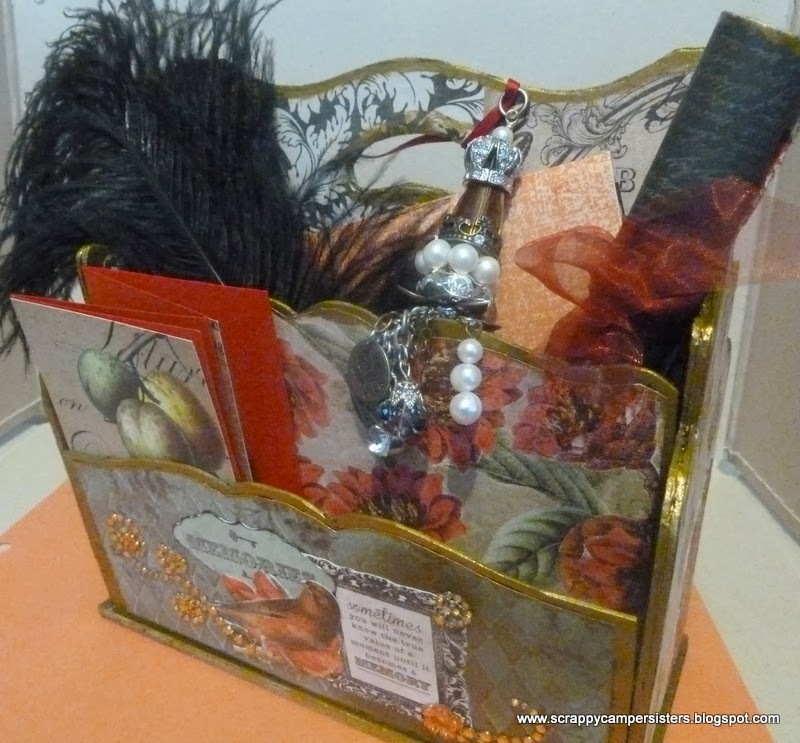 Place one card in each envelope, leaving one side of the card outside the envelope and with the two card folds in the center. 5. You can either leave the cards loose so that they come out, or glue inside so that it forms a simple book. 6. Fold the two envelopes together. 7. Glue the outside flap to the outside of the envelope. 8. Decorate with sealing wax. 1. Cut a piece of cardstock 4 x 9”. 2. Score at the 1” and 5” mark. 3. Cut 1” edge into flap. 4. Cut a piece of paper 5 ½” x 11”. 6. Attach the paper from the middle back section to the cardstock base, next to the flap. You may glue on three sides to make a pocket if you wish. 7. Attach a chipboard piece on the cover so that you can tuck the flap into it like a matchbook cover. JJ sent me potty money LOL so I just had to share. 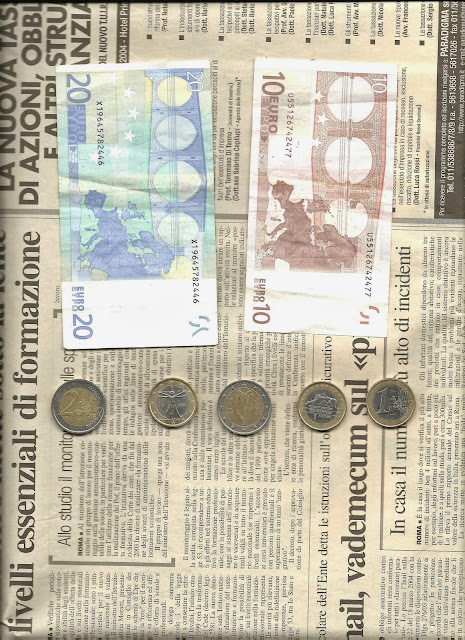 (I was telling people that when we were in Florence they make you put coins in a slot to use the public restrooms and so JJ decided to contribute to my cause especially since there is no potty on the bus) I also had the paper Euro left over from a trip and I thought it would look great in a collage. So HERE is your download for the day! Just rick click on the picture and save. Hi, Everyone! This is Darcie, inviting you to our Ustream show on Sat. Oct. 5, at 11:00 a.m. EST. As many of you know, we are going to Italy with Tim Holtz, Mario Rossi and 48 of their closest personal friends (as I like to say) in just a couple of weeks! In preparation for the trip, we are creating a letter holder inspired by the Florentine artisans who make lovely hand-crafted and gilded wares. Ours will be made out of chipboard rather than wood or metal but it will be fun just the same! You can download the pattern here. While in Italy, we will be creating daily "letters" to put in it and posting instructions so that you can follow along. 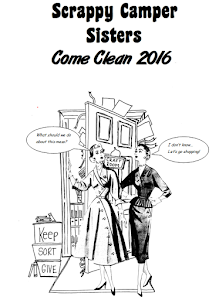 Johnna and I will also create some printables for you to download and will be sharing videos of our adventures. Also, we are very excited to meet Jim the Gentleman Crafter and Cesar, as well as Texas Barb and Kay. Should be a great time! DECORATIONS FROM YOUR STASH - BUTTONS, FLAT FLOWERS, BLING,ETC.